In addition to the enormous potential for profit, the barriers to the entry and start-up costs of a property cleaning company are relatively low. Many people consider starting their own property clean-up business because the entrance and the required capital of the start-up are significantly lower than other types of companies. A random query of founders of cleaning services online estimates that you can set up your own cleaning service for less than $2,000 dollars. 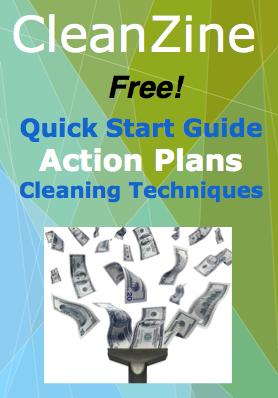 With the Clean Up Now System you can do so for under $400! The main factors to consider are the cost, your business model and how to market your new property clean-up service once you are up and running legally. You will need to choose a legal structure for your new cleaning service. You can operate as a Sole Proprietor or as a limited liability corporation (LLC) that protects the owners from personal responsibility. You can offer add-on services such as pool cleaning, carpet cleaning or gutter cleaning once you have a work history with a client. You can offer quantity discounts. For example, customers receive a free window cleaning after they have taken advantage of the services a certain number of times. You need to collect data for each cleaning job because the knowledge allows you to make informed decisions & take the appropriate actions with your cleaning business. Most people that start their own cleaning company, generally have professional knowledge of cleaning through previous experience, but it is not necessary, you can learn everything you need to know by having a professional mentor and business system. That can help greatly with the start-up phase in the short term and running your business long term. Depending on what professional cleaning niche you focus on, you will need to acquire some cleaning equipment and tools before you start actually cleaning spaces for clients. A professional property clean-up company is an excellent first-time business because of the low start-up costs and the simplicity of the business.